Starting from Cape Reinga at the tip top of the North Island (where you may find yourself lost before you’ve begun), question New Zealand’s dodgy measuring skills on 90-mile beach and do a crash course in shepherding as you navigate the livestock of Taranaki. Make sure you have your camera at the ready as you tour from geothermal pools to snow-capped mountains, golden beaches and the dense bush of the deep south. 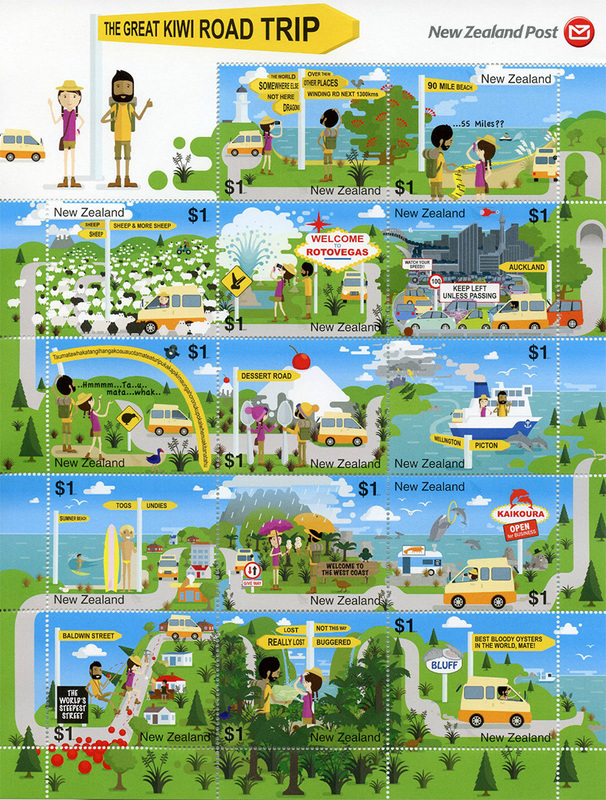 The ever-changing landscape will keep you entertained as you traverse the main highways and backroads of Aotearoa in this quirky stamp issue. Watch two oceans collide when you reach the end of the road at the very top of the North Island. And discover the 800-odd year old gnarled pōhutukawa tree clinging to a cliff on the northernmost tip of the Cape. Take a leisurely stroll along '90 mile' beach or jump in a 4WD to try out this sandy highway, yes it is in fact officially a highway. Make sure you take your tape measure to check the distance, you may find it won’t take as long as you thought. Admire the majestic Mt Taranaki from afar or get up close to experience some of its many attractions from walkways to ski fields to beaches. That is, if you don’t find yourself stuck among some of the slower paced, woolly locals. It’s not rated as one of the world’s best destinations for nothing! Awaken all your senses as you enter into the beautiful scenery of Rotorua and the not so beautiful smells. While wandering through 'Rotovegas' – you may find more than one person with a peg on their nose. Another day in paradise, sitting grid-locked in Auckland traffic. Make sure you make plenty of time to admire the beauty of this volcanic city and see some of awesome sights such as the Sky Tower despite the gridlock. This endless train of letters is New Zealand’s longest Māori place name. When translated to English it reads ‘the place where Tamatea, the man with the big knees, who slid, climbed and swallowed mountains, known as 'landeater’, played his flute to his loved one’. The locals simply call it Taumata Hill. Go volcano spotting as you make your way along the never ending ‘dessert road’. If tackling this never-ending highway in the summer be prepared for wide open blue skies and a barren but beautiful volcanic landscape. If you’re headed this way on a snowy winter’s day, good luck - you might find it open. Escape windy Wellington as you cross Cook Strait with a pod of dolphins putting on a show as they play in the ship’s wake. Admire the change in landscape as you travel further south, don’t forget a jacket if you plan to admire from the ship’s deck. Making the subtle distinction between togs and undies on a scenic beach is a challenge many kiwi’s face each summer. Remember, if you can see the water - they’re togs. If there’s no water in sight, well, best to have a towel handy. Enjoy an ice cream as you explore the West Coast’s wilderness and hidden pancake rocks and glaciers galore. Just make sure you’ve packed your wet weather gear. Watch out for seals and penguins as you make your way towards Kaikoura. Make sure you stop off in this wee seaside town for some whale watching and try some of the local kai, fresh from the ocean. There’s plenty to see when you’ve made it as far south as Dunedin. From stunning heritage buildings to the abundant marine life on the coast. Save some energy to climb the steepest street in the world, and watch out for any jaffa’s rolling towards you. 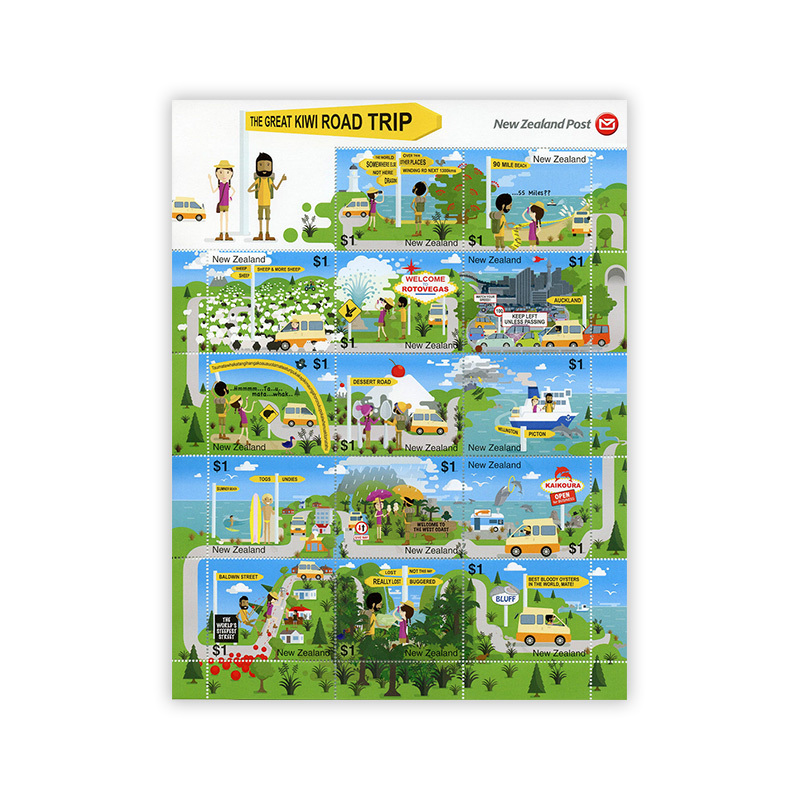 The walking capital of the world, take your pick from three of the best – Kepler, Milford or Routeburn tracks. If walking isn’t your thing then take a boat cruise, check out the glowworm caves or enjoy a scenic flight. Just before you drop off the edge of the earth, you find yourself standing under an oddly detailed street sign with an oyster in hand. This Southern, windswept town is known as Bluff and is famous for its local delicacy, oysters. Enjoy them fresh off a local fishing boat or battered with your fish and chips.